Food safety and environmental pollution are serious problems in China and rumors and public fears over cases of fake or toxic food can spread quickly. Food safety scandals have included reports of glow-in-the-dark pork, exploding watermelons, cadmium-laced rice, fake eggs, salmonella-tainted seafood, carcinogenic recycled cooking oil and pesticide-soaked fruit. In a single week in March 2011, state newspapers have reported that regulators found “unsafe artificial green peas” in Hunan Province and some 20,000 pounds of “toxic vegetables” in Guangxi Zhuang Autonomous Region. Those vegetables had excessive pesticide residues, according to a government Web site.In the case of the green peas, two illegal food workshops were caught processing dried snow peas and soybeans with chemicals and bleach to produce the appearance of more expensive green peas. frozen meatballs There have been nightmare tales in China of soy sauce laced with arsenic-tainted human hair; hormone-filled snack food that caused facial hair to grow on six-year-old boys and breast to develop on seven-year-old girls; and dangerous drugs given to pigs to make their meat look better. In Shandong people have died from eating leeks coated with pesticides. In 2001, a company that made drinks and vitamins for pregnant women was found to have used fake ingredients. In 2003, twelve children died and hundreds of others suffered brain damage or became of malnourished when they were given counterfeit baby formula that had no nutritional value. In December 2006, a factory manager was arrested for using used grease from swill, sewage and recycled industrial oil to make edible lard. A “toxic pesticide” was also detected in the lard. In the summer of 2006, 87 people became seriously ill after eating undercooked snails at a Beijing restaurant. In January 2007, nearly 300 employees of the BYD Co, a Shanghai automaker, were hospitalized after eating undercooked kidney beans. In March 2007, more than 400 people in Yunnan Province’s Lincang County were hospitalized with food poisoning they came down with at a wedding banquet. The dumplings in question’tezukuri Gyoza (handmade gyoza dumplings) and Tezukusamui Hitokuchi (handmade bite-size gyoza dumplings) “were produced by Tianyang Food in Hebei Province in China during early October 2007 and sold by JT Foods at Coop grocery stores in November in Hyogo and Chiba prefectures in Japan. Chinese officials said that the “no problems were detected at gyoza factory” and said it passed 24 quality checks since February 2007. The investigation was problematic. Many of the workers at the plant where the gyoza was made---which employs between 2,000 and 4,000 people---for example, left shortly after the business was implicated in the scandal. The workers were paid about $140 a month for working 10 hours and were paid less than other workers in the area. There were reports of angry workers at the factory and some speculation that a disgruntled employee may have deliberately poisoned the dumplings. Large amounts of frozen gyoza recalled following the revelations of food poisoning were distributed, much of it given free to workers as a bonus, to several steel firms in China. There were no reports of people suffering from food poisoning who worked at the steel firms and ate the gyoza. China’s state-owned Assets Supervision and Administration Commission ordered Hebei Iron & Steel to buy the recalled gyoza to bail out the food manufacturers under the commission’s supervision. Several people at the Tianyang Food company were detained and family members of factory employees were questioned. No hard evidence was found linking anyone to the poisonings. China’s food exports to Japan plunged 30 percent in February 2008 after the gyoza scare. In April 2010, authorities in China announced they had arrested a 36-year-old former employee at Tianyang named Lu Yueting for poisoning the gyoza that sickened 10 people. The suspect---a disgruntled temporary worker upset that he was treated differently than full time workers and his wide was not given a bonus when she took maternity leave---allegedly injected the gyoza with a pesticide on three separate occasions between October and December 2007. According to newspaper reports he used methamidophos pesticide taken from the cleaning department of the Tianyang Food Factory and syringes thrown away by a medical institution. The Chinese government banned the Chinese media from covering the arrest and were told to use official Xinhua news releases. 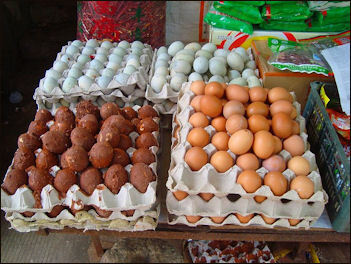 In September 2008, eggs tainted with melamine were found in Dalian in northeast China. A few weeks later melamine-tainted eggs that originated from the same city turned up in Hong Kong. The eggs were processed by Dalian Hanwei Enterprise Group. Eggs in Hong Kong produced by Jingshan Pengchang Agricultural Products in Hubei Province were also found to have excessive amounts of melamine. These disclosures set off concerns that melamine-tainted livestock feed had entered the wider food chain and tainted a wide range of food including farm raised meats and fish. In August 2011, AP reported, vinegar tainted with antifreeze was suspected of killing 11 people and sickening 120 after a communal Ramadan meal at a village in Hotan China's far western region of Xinjiang. Investigators suspect the victims consumed vinegar that was put in two plastic barrels that had previously been used to store toxic antifreeze, the official Xinhua News Agency reported Monday. The victims were Muslims who were sharing an evening meal after the daily fast observed during the holy month of Ramadan. Xinhua said children as young as 6 were among the dead. One person among the 120 sickened was still in critical condition. China’s food safety problems are well-known and revenge attacks using rat poison or other chemicals also occur. But accidental contamination is also a problem, caused by low hygiene standards, particularly in rural areas, and weak quality control by regulators. The Shanghai quarantine bureau said it destroyed 1,872 kilos (4,100 pounds) of chocolate almond cake imported by Ikea that it said had excessive levels of coliform bacteria. Ikea spokeswoman Ylva Magnusson said the cakes were destroyed in November and December but the company's head office had only found out about it on Monday. "The product was stopped and destroyed. So none of the cakes made it to our restaurants," she said. Magnusson told The Associated Press that Ikea on Tuesday also had withdrawn chocolate and butterscotch almond cakes from its restaurants in 23 countries after a batch was found to be contaminated with the coliform bacteria. The cake, made by a Swedish supplier, was withdrawn before it was sold in Ikea restaurants. "It posed no health hazard as it was never sold," she said. The Nestle chocolate contained too much sorbitol, a sweetener that in large amounts can cause bowel problems, the agency said in a statement. Phone calls to representatives for Nestle were not answered. In an emailed statement, Kraft Foods China said it imported a batch of cheese products from the U.S. to be used only as internal samples. The company, which is part of Mondelez International Inc., said the products didn't receive certification by the expiration date. "We hereby sincerely apologize for all the concerns and doubts brought to consumers by this incident," the statement said. 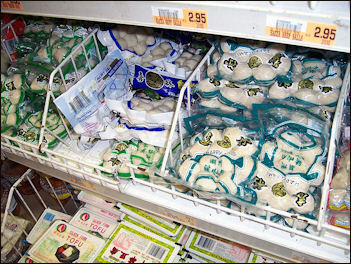 Shenglu is one of the bigger processed bun manufacturers in Shanghai, producing about 30,000 mantou's that are sent to about 400 retail stores across the city everyday, including Hualian and Lianhua supermarkets. A massive recall has already been ordered and the Shanghai Industrial and Commercial Administrative Bureau has promised a city-wide inspection. Investigators found Chen, who sold rat poison as a business, had put the chemicals in the kitchen when he moved home. Reports of usually non-fatal food poisoning at school canteens and restaurants, especially in the countryside, are common. Regulators are now searching for illegal oil recycling mills, and some health bureaus have begun releasing the names of restaurants and food establishments that were found to be using questionable oil. Last November, regulators in southern China raided several workshops for turning discarded waste---possibly even sewage---into cooking oil. In the city of Chengdu, in southwestern China, food safety officials released the names of 13 restaurants that were found to be using illegal cooking oil. The restaurants specialized in hot pot, a popular simmered dish. City residents voiced anger at Chengdu regulators for having delayed the release of some of the names of the implicated restaurants, according to the English-language newspaper China Daily. Here in Shanghai, regulators have warned that illegal cooking oil could be a problem because a large portion of restaurant food grease goes unaccounted for. Police in Henan and the eastern provinces of Zhejiang and Shandong have found more than 100 tonnes of the recycled oil illegally made from leftovers taken from gutters, the Ministry of Public Security said in a statement. The ministry said six workshops were closed, including one operated by Jinan Green Bio Oil Co., a business that claimed to be turning kitchen oil into fuel but that was actually churning out recycled cooking oil that it passed off as new. Recycled oil can contain carcinogens and traces of aflatoxin, a potentially deadly mold. "Not only did we destroy a criminal chain that was illegally turning gutter oil into food oil, we also unveiled the greed of the criminals and pulled back the curtain on the immoral acts of those producing this poisonous and harmful food oil," the statement said. It didn't specify what charges the 32 people in detention would face or say when the crackdown started. Reporter Killed Because of the Cooking Oil Scam? The laptop computer Li had been carrying was missing and police were treating the case as a murder-robbery, but have not ruled other motives, the report added. The last post on Li's micro-blog on September 15 said web users "had complained that Luanchuan county (in Henan) has dens manufacturing gutter cooking oil, but the food safety commission replied that they didn't find any". Bloggers said they suspected Li's death was related to his previous reports on the "gutter" cooking oil cases. "Luoyang Television Station reporter Li Xiang got stabbed to death, I suspect it's related to his reports on 'gutter' cooking oil," a web user said on Sina's popular social networking site Weibo. "Li Xiang's stabbing death is the unfortunate outcome of investigating the gutter cooking oil cases," another user said. Mr. Li’s employer at Luoyang Television has expressed doubts that his murder was connected to his work, saying he seldom took on investigative projects. Violence against muckraking journalists is rare in China although intimidation by the police and government officials is not uncommon.